Products and services offered by Crescent Moon Beads. We carry a variety of jewelry and beading supply. 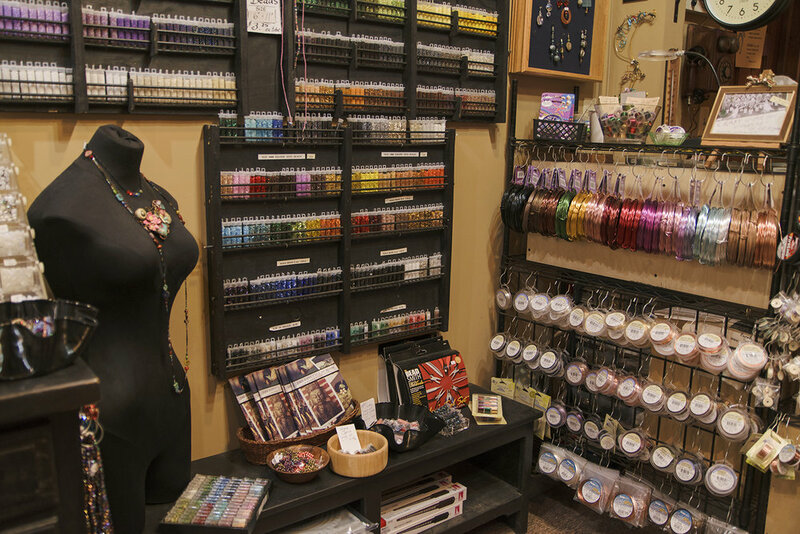 Tools, wire, seed beads, pendants, and more can be found in our little shop. Our supply varies as we try to test out different tools and stringing material to only carry the ones that work best for us. If you have any questions, please contact us and we can help you first hand. If we vouch for it, you know we use it! A store favorite for sure, Czech glass comes in all shapes and colors. We carry as much as our little store can hold. As styles change by season, please contact us in store to see if we have what you are looking for! We don't care for leather cord so we offer the vegan version...woven waxed cotton cord! It doesn't dry out like leather and softens as you wear it. We carry 2mm and 1mm options in a variety of colors. We carry a variety of semiprecious gemstones in different cuts and sizes. The selection is ever changing so check in to see what is new! Like the mood beads you see above, we like to find unique and interesting statement beads. Ceramics that are locally made for us, as well as lampwork and blown glass are just a few of the other special pieces that call our little shop home.